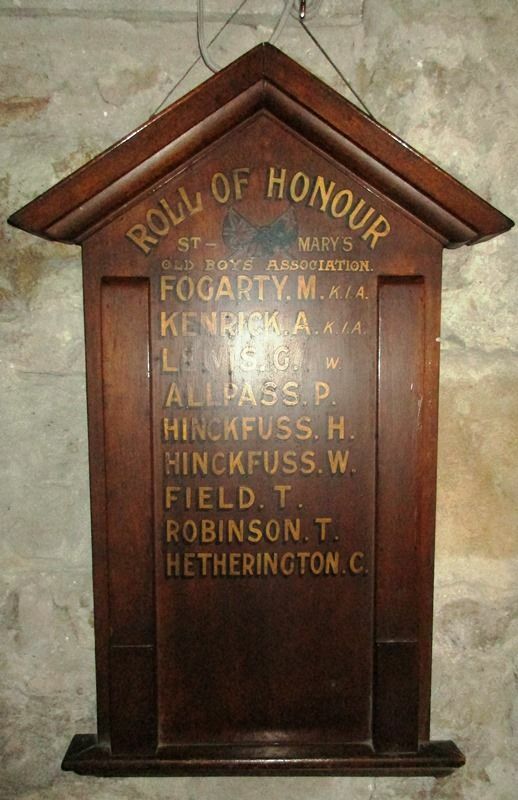 A wooden honour roll commemorates members of St Mary`s Old Boys Association who served in World War One. 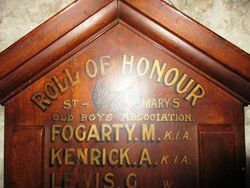 The annual meetng of St Mary`s Old Boys' Club was held on Tuesday night, in the Parish Hall, Kangaroo Point. Officers for the ensuing year were elected as follows: -Secretary W. McDonald (re-elected), treasurer W Grant (re-elected); auditor, W. Field. The balance sheet and auditor`s report were adopted. The club's honour board has just been finished. It bears the names of 10 members who answered the call, two have been killed and four wounded. The honour board will be unveiled at a later date. Brisbane Courier (Qld), 13 March 1919.